Given that I’m doing a bag making tutorial once a month, I thought I’d also listen to my quilt making readers and give them a tutorial too. 1. 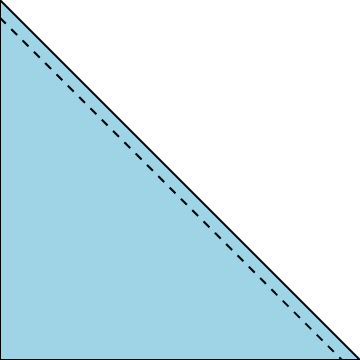 Cut your fabric into triangles and sew them together (dashed line). The risk in this is that you are sewing bias edges together which are prone to stretching – starch will help to reduce this, but it is a risk nonetheless. 2. The 2 square into 2 HST method. By putting squares of your two fabrics right sides together and drawing a line from corner to corner on the diagonal (solid line), you can then sew with a 1/4″ seam on either side of the line (dashed lines) before cutting along the line, opening out and pressing. 3. The 2 square into 4 HST method. 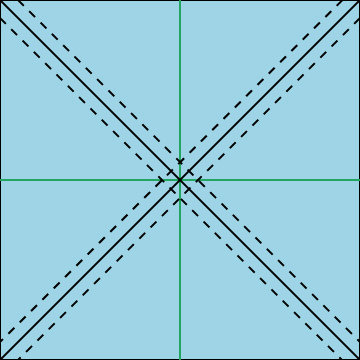 Again this uses the idea of placing the squares of your two fabrics right sides together, but in this case you sew around the perimeter of the squares using a 1/4″ seam, pivoting at each corner (dashed lines), and then cut on the diagonals (solid lines), opening out and pressing. Although this gives you 4 matching HSTs, again this leaves you with bias edges, not when you sew the HST units, but when you want to join them to other parts of the block, so again I would suggest that you proceed with starch. 4. The 2 square into 8 HST method. This is the mind blowing approach to the 2 square method, and gives you 8 matching HSTs at the end. There are no bias edges, but it’s a little more complex. 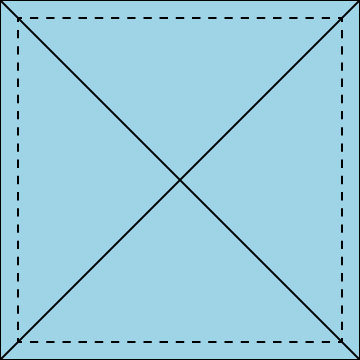 Firstly draw a line from corner to corner on both diagonals (black solid lines). 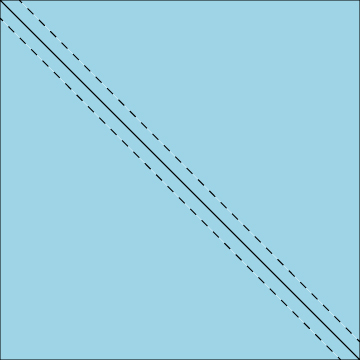 Sew on either side of both lines with a 1/4″ seam (dashed lines). Cut up both the diagonal and green lines, then open out and press. For the most part, since it’s unusual to require that HSTs in your block, or at least in your quilt, be completely unique, the last three methods will generate HSTs faster for you, but I have to say option #2 would be my HST of choice, the first because I’m not fond of squirmy fabric, and the second because I’ve never wanted that many matching HSTs! Still, I’ll give you measurements for all of them, and you can choose for yourself.Note, for method 1, cut triangles from squares that are the same size as for method 2. Ooooh, I love charts like these! And I actually hadn't realized that method 4 made 8 HSTs — I thought it was just a different way of sewing method 3. Neato! This is great information!! I've done the 4 out of 2 blocks, but not the 8 options! Nice! Thanks for sharing! The chart is good to have for when you are planning your quilt. Good luck with your bag tut's. Super duper info, thanks for taking the time!! I tend to make mine the second way. The methods with bias edges make me nervous. And now I am kicking myself for not knowing the 8 method, after making a bajillion by the second!! Lol! I usually use the two squares into 2 x HST's method . Id never even thought about being able to do more than that. Off to pin this to Pinterest Ms. Katy! Thanks ! I'm a 2 at time person. I do use the 8 every now and again but avoid the 4 as I am rubbish at not stretching bias edges. I saw some people making them from tubes as well – seems weird to me! Great post! I like method 2 personally though I've used all 4.